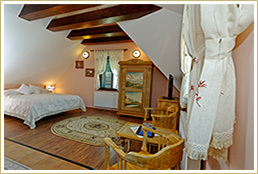 The Ambient Villa offers privacy and luxury with all the conveniences of a full service hotel. With a total of 11 rooms, our villa can accomodate 12 persons in 6 bedrooms, one open-plan kitchen, one living room, one dining room with fireplace, a cellar, and a game room. The six rooms, each furnished with double beds and each with en-suite bathrooms are pleasantly decorated in the Saxon old-style of this enchanting small town. The warm hues of the wood, the stone carvings, the beautifully coloured furniture and the embroidered bed-linen and drapes, as well as many other well chosen accessories make you feel as if you have just woken up from a time-machine journey... a long way back in time... but with all the amenities and facilities of the modern world at hand! The richly appointed dining room, offering space for 22 people, promises moments of gastronomic delight, prepared either by yourselves or by a chef, upon request. 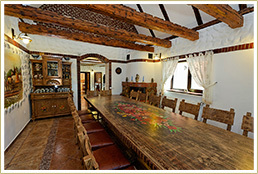 The very long table in the middle, made of wood decorated with colourful floral patterns, together with the romantic fireplace seem to invite you to a grand feast, not just any ordinary dinner or lunch! 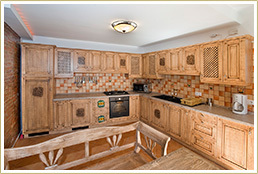 The Ambient Villa's kitchen is fully equipped, it has oven, electric hob, refrigerator, microwave, coffee machine, kettle and everything you might need for a long stay!